It was a quiet day on Twitter on Monday. Not only the players in Khanty Mansyisk needed a rest day after Sunday’s fireworks, obviously! 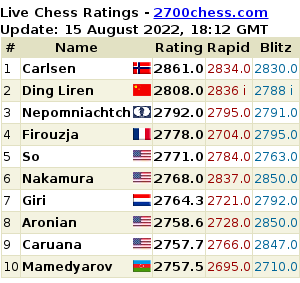 There were hardly any entries under the hashtag #Candidates2014. Well, round nine was exciting, wasn’t it Mr. Kenmure? Picture posted by @garylanechess during round nine:“Arbiter Jamie Kenmure having fun at the Candidates. The highest ever honour by an Australian arbiter I think”. Top players are looking forward to round 10: Dutch GM @anishgiri: “Looking forward to the final stage of the candidates starting tomorrow! #haterestdays #unlessiamplaying“. Don’t we all agree with Teymur? Let’s go to the games. The pairings for round 10: Karjakin-Andreikin, Kramnik-Svidler, Aronian-Topalov and Anand-Mamedyarov. @MarkTWIC: “R10 Funny thought occurs to me. The players will be getting up and starting to prepare. I’ve not gone to bed yet!” @rachapalli tweets: “Long sleepless night ahead for us in Canada.” @teotsorb: “10th round could be more excited than 9th! Still 5 rounds & nothing decided. Younger players look better in 2nd half”. @Jonathan_Rowson: “Just saw what happened to Kramnik. Ouch! Blunders are so profane, but they decide most games, even at the very top.” @PeterWarne29:” I’m devastated for Kramnik right now. I really hoped he would have one last shot at the title”. @TarjeiJS tweeted this picture from the Norwegian paper @dagbladet: “Shocking big blunder by Carlsen challenger”. The end of round 10 was an important one: @MarkTWIC: “The Russians have finished all their games against each other.” @Pookita: “So the “conspiracy” involved vaulting Anand to the top? :)” Grandmaster Jonathan Tisdall, @GMjtis: “Well, I hope all those silly Russian conspiracy theorists are hanging their heads and apologizing”. And I will leave you with a final tweet from “The Week in Chess” editor Mark Crowther: @MarkTWIC: “Confirmed the important story of the day. Svidler did indeed have a split in his trousers during play today”.